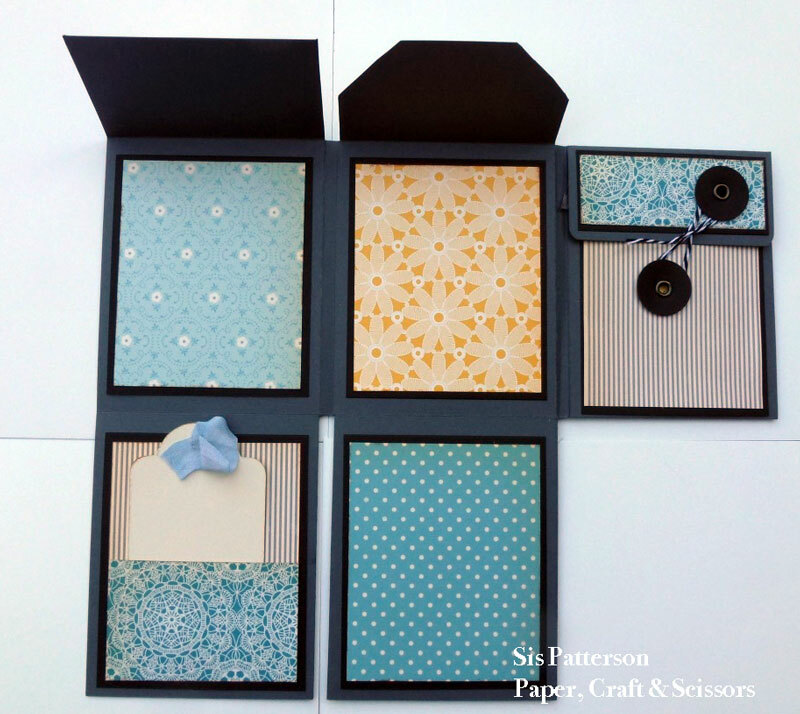 Here is a little folded album that uses one piece of paper as its foundation. 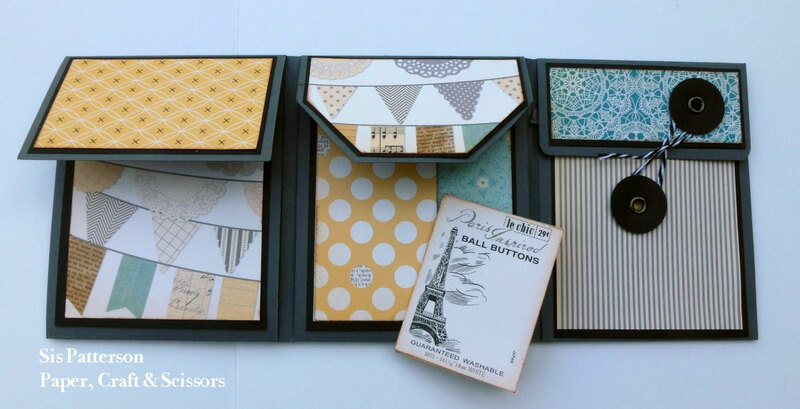 I made this “one sheet wonder” in response to a National Scrapbook Day challenge from a friend. This is the pin that inspired me to try it out and a big assist from Nadia at withglitteringeyes.blogspot.com who translated the metric measurements from the original site into standard measurements that are applicable to U.S. scoreboards. Start with a 12” piece of cardstock and put it on your score board. If you click on the steps below, you can see a graphic that explains the directions. Score at 2 3/8” and 7 1/4”. Now, rotate your cardstock clockwise so that the score lines are horizontal. The 2 3/8” score line should be towards the top of scoreboard. Score again at 3 7/8”, 4 1/8”, 8”, and 8 1/4”. When you look at your scored piece of 12” cardstock, you will have 3 top flaps and six similarly sized rectangles. Using your paper trimmer or Xacto knife, trim the the 1/4” scored area from the bottom row and top flap. Always stop trimming at the first horizontal score line. Trim the top flap so that it measures 1 3/4” from the score line. Using a corner rounder, trim the outside edge of the flap. Trim the lower flap so that it measures 3 3/4” from the score line. Cut a piece of patterned paper that measures 3 1/4” by 3 3/8”. Cut a mat that measures 3 3/8” by 3 5/8”. Adhere the mat and patterned paper to the outside of the lower flap. Using a 1 1/2” circle punch, punch a semi circle in the lower flap edge. Attach closure mechanism to the lower flap. Using 1/4” ScorTape, tape the two side side edges and bottom edge of the lower flap and fold up to make a pocket. Flip the lower flap up and using 1/4” ScorPal tape, adhere to center section to make a pocket. For the middle flap, trim a triangle from edge to make a pointed flap. Flip the triangle, place on the left edge of the middle flap, and snip the same triangle again. No need for measuring or aligning – your flap will be symmetrical. To decorate, cut various patterned papers at 3 1/4” by 4”. You will need a total of ten pieces of this size. I added a 3 1/2 ” x 4 1/4” solid mat under each patterned paper, you will need ten of those as well. I also added an extra chipboard mat on the front and back cover so that the weight would help keep the book closed. Once it gets filled, the owner may wish to make a belly band of it – but I know her mom will help with that if necessary. 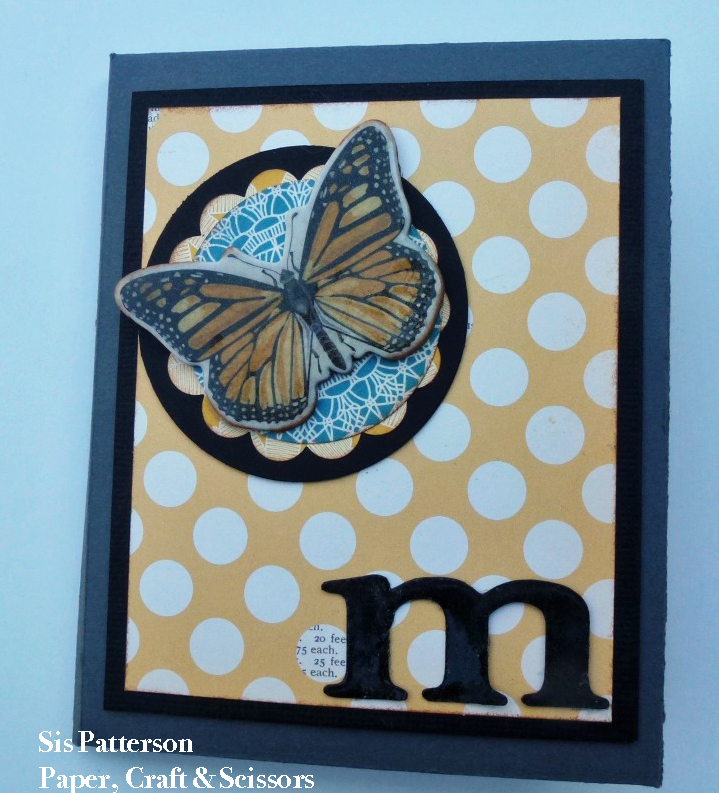 The butterfly on the front cover is from October Afternoon’s Farmhouse collection. 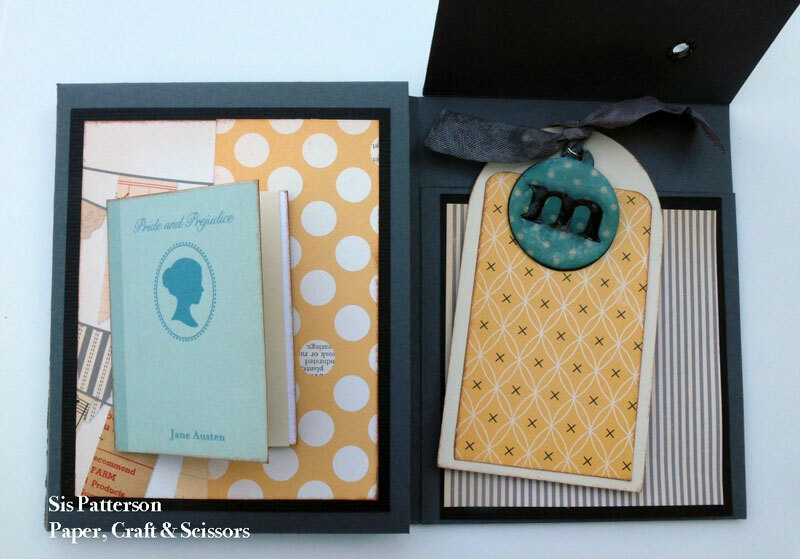 I used champagne sparkle Versamark and Ultra Thick Embossing Power to add a little shine and sparkle. The “m” is embossed in similar fashion. The “m” is from the Close to My Heart Artiste cartridge. The inner tags are from the Close to My Heart Art Philosophy cartridge. I used the “m” again from Artiste and embossed again. The tag is attached with a jump ring to the ribbon. The little books were cut from the Farmhouse paper. I also added a back of the same size and made a little folder. This is for a special young friend who is packing up soon and heading out to new adventures and new friends. I thought she might like a little book to tuck away some of her memories of living in Rhode Island. Another paper flower bouquet in a mug – this one is for Valentine’s Day. The rolled flowers (about 22) are all from the Close to My Heart Artiste cartridge. I cut a variety of sizes from 4.5″ to 3.25″ in three colors: a bright red, a dark red, and a chocolate red. I love the mix of colors as it adds depth and some sparkle. 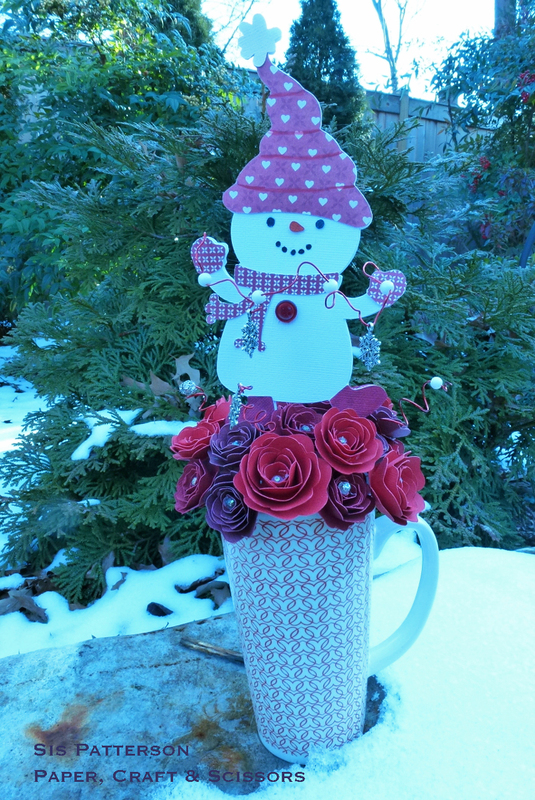 The Snow Man is from Cricut Snow Friends and measures 5″ tall. The patterned papers are from Cosmo Cricket’s Tea for Tea mini-deck and the solid colors are from American Crafts Valentine pack. I used a combination of corsage pins and floral wires for the rose stems. The Snow Man is holding a jewelry wire “banner” of beads and snowflake charms. The wire measured 11″ before twisting and shaping. The ends are attached behind his mittens. I used Cricut Craft Room to hide the contours in the Snow Man and flipped him horizontally to create his backside. I also flipped all of his accessories. His scarf was hand-trimmed as the ends are only visible on the front. When assembling, do the front first, and then turn it over to act as a guide for placing the back accessory pieces to ensure alignment. 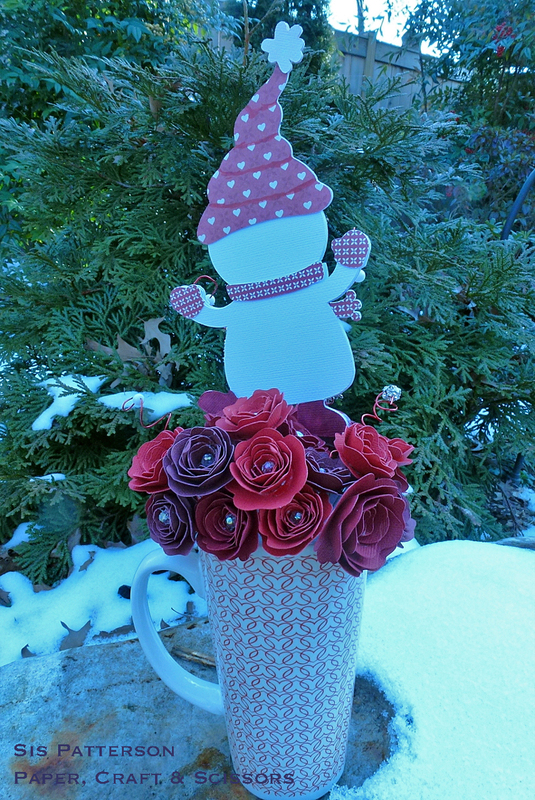 I purchased the mug at JoAnn’s and inserted a styrofoam disc to build the flower base.